"Evening at the Moose Track"
Whimsical Moose "Evening at the Moose Track" by artist Chris Harman from the Moose Capital! More Moose have been reported in the Luce County and the Newberry Area than any other County in the State of Michigan. Living in a quiet place centered within the Heart of the Upper Peninsula, we enjoy both the serious side and humurous side of wildlife and our surroundings. This Whimsical Moose Art was inspired by actual people who live, work, and find recreation in the beautiful Upper Peninsula. 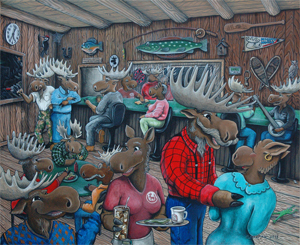 The characters depicted in Evening At the Moose Track reflect real life people who reside locally in the artists home town.